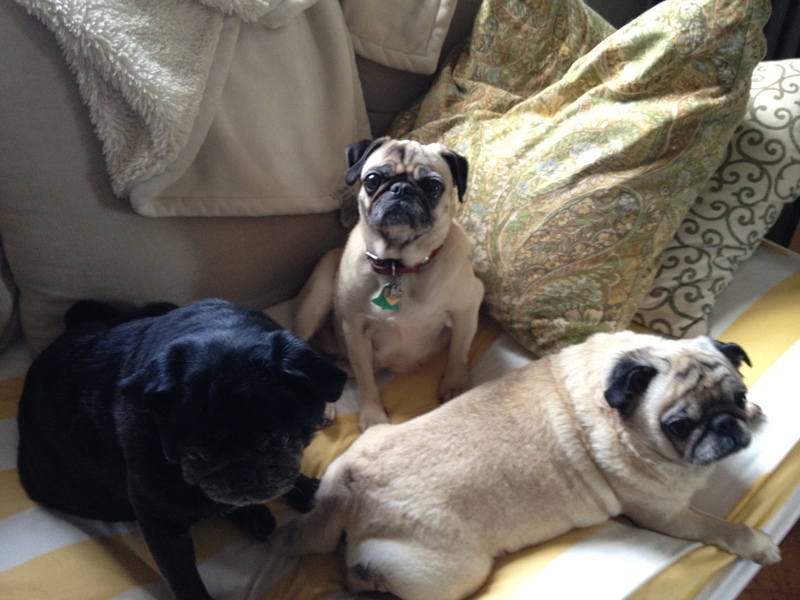 The other day I started my daily routine, feeding and medicating and walking the pugs, get my cup of coffee and sit down at the computer to see what I missed after sleeping all night. I saw a post from The Solitary Cook, one of my favorite blogs and just have to say that she is someone I greatly admire and look to for inspiration. The title of the post was DAVID LEBOVITZ’S ROASTED FIGS, I was immediately drawn to this recipe. First, I LOVE figs, fresh figs not dried. 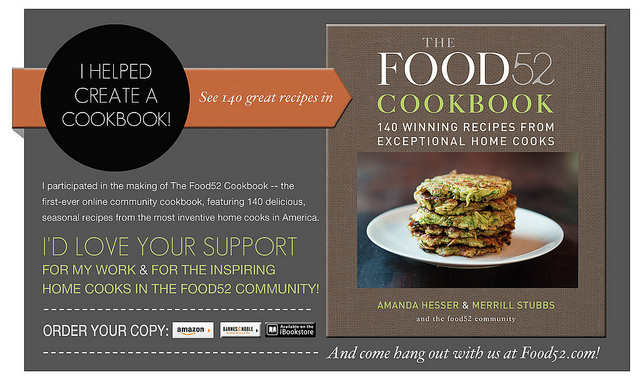 How could I go wrong with a recipe from the very talented Mr. Lebovitz and Cynthia (The Solitary Cook). I knew this would be wonderful. Now this was a revelation for me, really it was. I always poached my figs, at least the figs that I didn’t eat fresh. It never dawned on me to roast them. (one of those aha moments). Imagine roasting fresh figs with rosemary or thyme, honey and wine. I was immediately drawn in, inspired and I had to make this right away. I changed the recipe ever so slightly, instead of red wine I used white and I chose to use thyme as Mr. Lebovitz suggests (because thats what I had) and thought that whipped goat cheese and mascarpone lightly sweetened with the syrup from the roasted figs would be wonderful. I really recommend you try this delicious recipe, it’s absolutely amazing, and if you are a fig lover like me you will be in fig heaven. whip the cheese and syrup together with hand held mixer. Easy right? Add a dollop to the figs. Drizzle with some of the syrup. It’s heavenly!! Yes. figs are so good. I love how simple this is too! Thank you. David, then Cynthia and now you guys ar driving me crazy on this last winter weekend where I live. Suzanne you’ve done it! Looks like a perfect marriage of produce and method. Yum! I hunger for figs at the end of every winter so much. Sweet torture reading your gorgeous blog post. I would have to agree with the great Mr. Tanis, fresh figs are one of lifes great pleasures and I look forward to when they are in season every year. This simple way of enjoying them is now one of my absolute favorites. 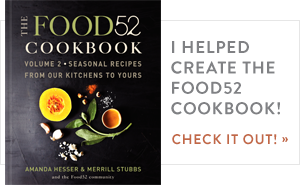 I am thankful for Cynthia and Mr. Lebovitz for this recipe. Thanks so much Karen. They are and thank you so much Uru!! I had a wonderful roasted fig appetizer at a Fort Worth restaurant that had gist cheese. It was fabulous! Roasted figs and the goat cheese are a marriage made in heaven. So good together. Thanks so much Maria! I just read your rigatoni post and now this one! You are making my grocery list grow by the second! am very excited about this one. This recipe will be my first fig purchase of the season. They are looking real good right now so your timing is perfect. Thank you! I was lucky enough to find some beautiful figs and I love this dish, the figs are so soft and juicy and the goat cheese and mascarpone are perfect with them, I hope you enjoy, I sure did! Looks so fresh and healthy! I love that they need no sugar either. It’s just perfect for this awful heat! It’s so light and the perfect dessert when it’s really hot out. Texas is getting slammed, I know it’s been terribly hot there. Hope you get some relief soon. Thanks so much Brandi. Yum is right!! These roasted figs sound absolutely lovely. I love the addition of herbs and pairing them with cheese. I’m definitely making this soon! Thank you so much, I am always sad when fig season is over. I need to preserve some of the roasted figs so I have them all winter. I made my roasted figs and adored them. Sam is going to enjoy them with Greek yogurt while I am traveling. They are the best and with greek yogurt, delicious!! Thanks Bevi. And fresh figs haven’t made an appearance as yet. So looking forward to them. And will definitely roast them to try them out. I’m also waiting for persimmons as well as they could be used for my blueberry bread. I so love figs, we are in the height of fig season right now so they are everywhere. I love persimmons too and can’t wait to see your persimmon bread. I have never baked or cooked with them before. Thanks so much..
That looks like a dessert. It looks wonderful. I’m not crazy about goat cheese. Do you think it would work if I eliminated it? It’s a wonderful dessert and yes, eliminate the goat cheese and just use the mascarpone. It would be delicious. Thanks so much. – I don’t consume alcohol and don’t like thyme. However, I want to roast some figs. How much honey for the amount of figs you show in your first photo? – I know how mascarpone tastes but I don’t know how Chevre tastes. By mixing these two cheeses, what kind of taste? consistency? are you seeking? Hi Fae; You can certainly omit the wine and thyme, you could sub a fruit juice for the wine and the thyme is so understated you can leave it out totally, I didn’t measure the honey, I guess if I had to guess I used 2-3 tbs. Really I just drizzled it all over the figs. Goats cheese is very distinct, I love it but it’s got a fairly strong flavor and very tangy. I mixed it with the mascarpone for 2 reasons one to tone down the strong flavor of the goats cheese and the other reason was because I wanted something very creamy but with a more pronounced flavor than plain mascarpone which is why I mixed the two cheeses. Hope this helps. Thank you for the response, Suzanne. I’m off to get some figs… Yahoo! I love figs and these do indeed look entirely heavenly. Is it greedy to think that they would be perfect with a good steak? 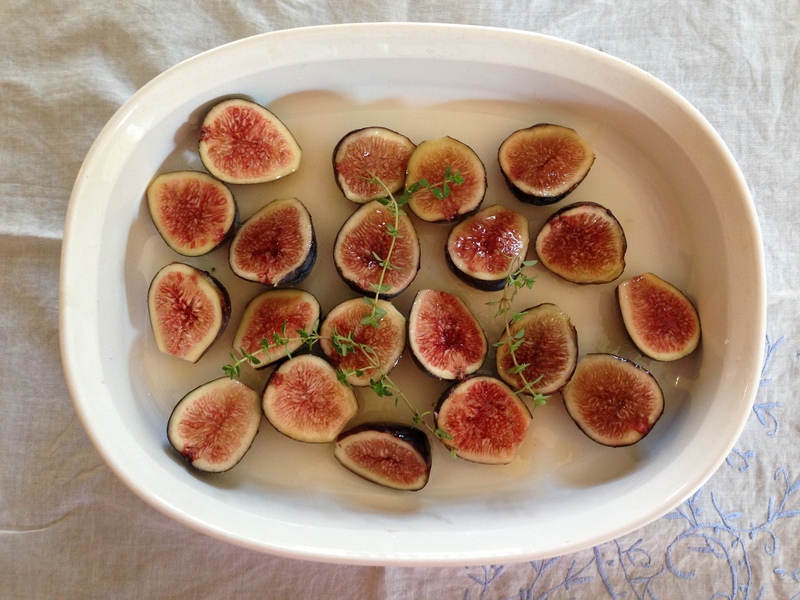 Love the beautiful shot of the figs before roasting and a “keeper” recipe. They would be great with steak or even lamb.Thanks so much Azita! Heavenly combination. I love fresh figs and we have a tree full of them ripening at the moment. Now I know what to do with some of them. Can’t wait! Oh how luck you are, wish I had a fig tree. Thanks so much. 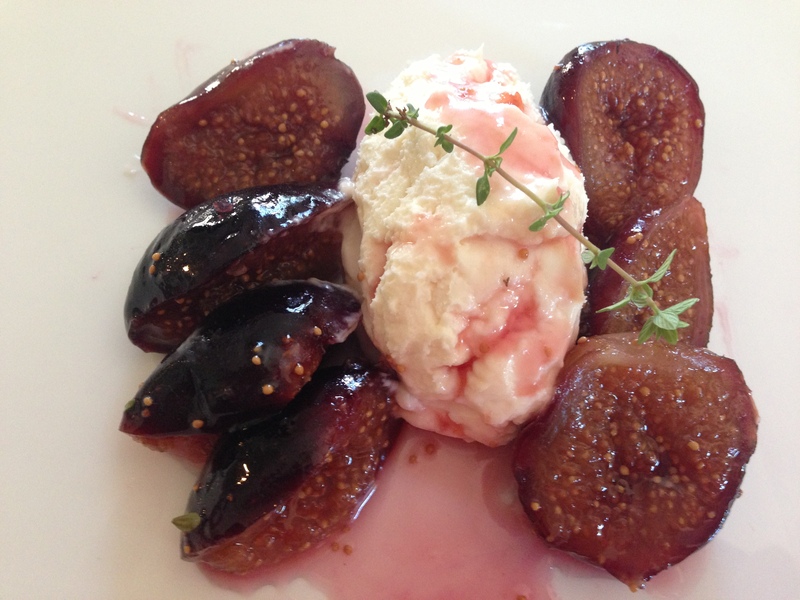 Seems an elegant start to a meal– I’ve never had roasted figs– would love to try this while they are still available! thanks!! Prior to this I had never roasted figs and must say when not eating them raw and fresh this is the way I plan to enjoy them. Thanks so much. i love figs but is hard to find it here. Sorry figs are hard to find, they are delicious. I wish I had a fig tree! !Thanks so much. Thank you, yes the goat cheese and mascarpone is a great combination and perfect with the figs. It seems that there are endless ideas and combinations of different foods when you search the internet, thats what I love about it! Figs are one of my favorite fruits ever, they are so special and taste like no one. So that roasted figs, oh my goodness they look so incredible ! Please, forgive my time off from blogging.. I will explain you soon, text me when you have free time ! I wondered if you had come to NYC, I know how busy it is when you are travelling. Look forward to hearing about your adventures. Thanks so much, Figs are right up there for me too, I think right under plums! Delicious. There are far too few fresh figs in my life. Are you lucky enough to access to someone with a fig tree? I have to investigate the one I found in Brooklyn but I think others have the same idea because every time I stroll by the lower fruit is picked off. They had some figs at the farmers market was lucky, I wish I knew someone with a fig tree. Figs seem almost elusive, come and go so quickly and when they appear are snapped up very quickly. Thank you profoundly for the kind tribute, Suzanne. Your mascarpone and goat cheese combination gilds the lily! I made French toast this morning and spread some figs and their precious juices over it. I may never be able to eat it any other way. I meant every word. Oh yes, on french toast sounds heavenly!! Wow! This recipe looks outstanding! I wish I had some fresh figs on hand right now! I have to find some more before they disappear. I am going to roast some more and preserve them I think. I want to have them all winter. Suzanne, I talked about this recipe with my mom and she wants to do it tonight for a dinner party she’s attending. Question: halve figs and bake for 20 minutes in 400 degree oven, correct? Yes 400 degree’s for 20 minutes, sprinkle with a little natural or brown sugar and dirizzle with honey, put cut side down in the baking dish. They are divine. Hope your Mom likes them. I used white wine but Lebovitz used red (I think white is very nice with the figs) Also be sure to use the right size baking dish, the figs should be snug in the pan so that the juices don’t evaporate. I passed along the directions. Can’t wait to hear all the “juciy” details! I also want to hear how it went!! d’oh … also meant to way: thank you! I keep seeing recipes for Figs, but have never tried any. I love to eat figs but don’t know how to cook with them so your post is inspiring. I particularly like the mascarpone and also the thyme (I have just started using thyme in desserts, always used it in savory dishes). Am always intrigued on anything David Lebovitz suggests and will now have to check out the Solitary Cook too. 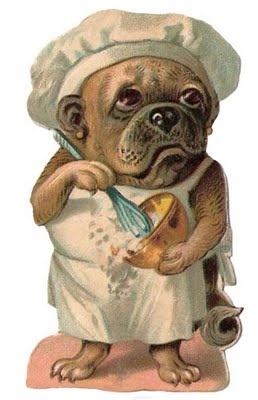 Your dish looks mouth-watering! Thanks Claire, I found this recipe to be a revelation and for something so simple that’s saying something. Please do check out Cynthia’s blog, it’s wonderful and as for Mr. Lebovitz, he is one of my all time favorites. If you try this I hope you like it as I did, the thyme is very understated but you know it’s there. The figs are soft and supple and juicy. Absolutely delicious. This looks so amazing! The flavors sounds great! Thanks so much, fresh figs make me happy!! Suzanne this figs look super delicious! I’m going to try them once I’m back from my vacation and I’m also going to finish the second post of our fish & wine pairing collaboration. I haven’t had much time lately but maybe I can do it during my vacation if not then I’ll write it once I’m back. Thanks Julian, hope you are having a great vacation! Look forward to the second collaborative post and when you give those figs a try would love to hear what you think. Have a great time! 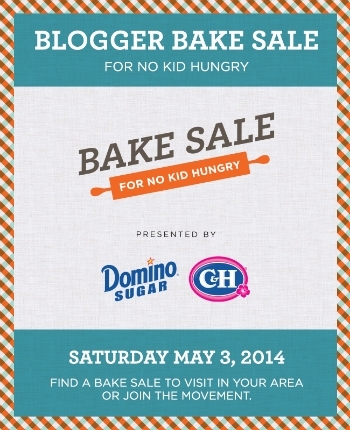 Do you have a whole foods near you? They usually have them. I wish you could find them because this really is so good. So, I will raise my hand and admit I’m not a fig lover. I like the FLAVOR of them, but those seeds? I can’t do it. However, I also have a stubborn streak – when I don’t like a food, I eat it as many times as necessary for me to start appreciating it. It’s a bit ridiculous, but I WANT to like figs. And I feel like when they’re topped with whipped goat cheese and mascarpone…how could that NOT be step #1 of me beginning to like them? I really dislike dried figs, I will only eat fresh ones. I know what you mean about the seeds and must say the creamy cheese makes you forget about those pesky seeds. Lovely and syrupy looking figs! Thank you so much, the syrup is wonderful! This looks absolutely gorgeous Suzanne, and so delicious! You are so sweet Lindsay, thank you so much!! Thank you, you are so right, not just a dessert! Thats one of the reasons I added mascarpone along with a little of the syrup, goat cheese has a tendency to crumble and when you mix in the creamy mascarpone or you could just use heavy cream for that matter you get a creamy consistency. Thanks so much! We are now coming into the apple, pear and orange season here. Will sorely miss all the summer fruits. I also love figs and mascarpone. This looks fantastic! Will have to give this a try soon, before there are no more fresh figs to be found. Beautiful! Thank you, it seems like figs disappear in a mere blink, I hope I can find more this weekend at the market. Those figs just spoke to me, sounds weird I know but the idea of roasted figs was intoxicating, I am such a lover of fresh figs. The goat cheese and mascarpone mixed makes a creamy somewhat tangy accompaniment to the figs. Thanks so much Susan! I ADORE goat cheese, but alas, much to the dismay of my Italian-fig-loving-mother, I dislike figs 😦 Looks lovely though! Oh it’s almost a requirement to like figs when you are Italian, my Father used to eat those dried figs all the time (really don’t like them). I do like fresh though. Thanks Christina! Yum. I’m making some Italian appetizers this week for some visiting friends, and I think I’ll add this to the list. I just subscribed to your blog, can’t wait to see what else you are making! 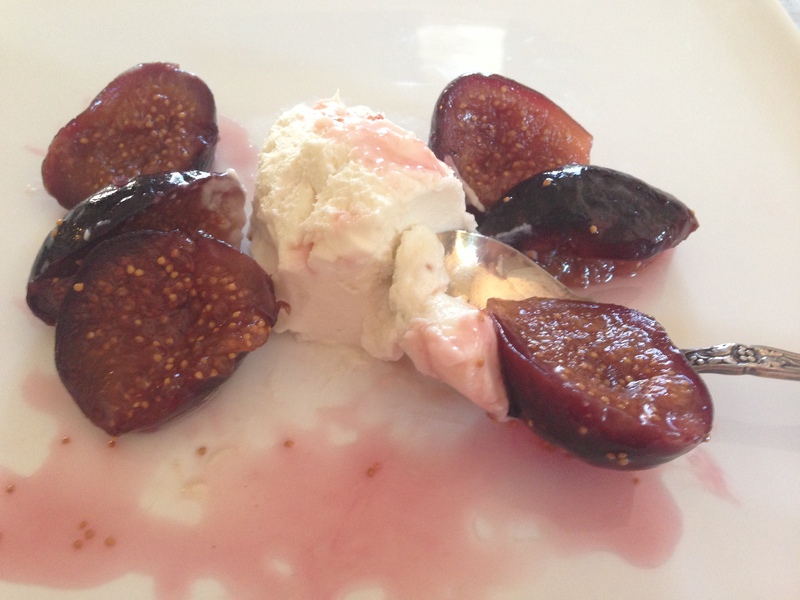 Hi Meg; The roasted figs and mascarpone would make a delicious appetizer. Thank you so much! Looks amazing, I love figs!